Felix Tshisekedi Is Declared Winner. Will He Fix Troubled DRC? Will This Election Change the DRC? 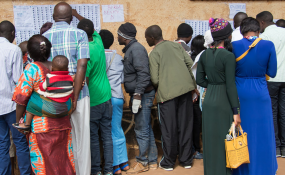 Voters look for their names in the lists during Presidential and Legislative elections in in the Democratic Republic of the Congo (30 December 2018). The African Union says "serious doubts" remain over Democratic Republic of Congo's election results. The AU isn't alone in expressing qualms about the outcome of the presidential election. The African Union (AU) on Thursday called on the Democratic Republic of Congo to suspend the release of the final results of its disputed presidential election due to its doubts over the provisional results. The AU's call came after a meeting of the bloc's leaders in Addis Ababa, where AU Commission Chairman Moussa Faki Mahamat said "serious doubts" remained after Felix Tshisekedi was declared the presidential election winner. "The heads of state and government attending the meeting concluded that there were serious doubts on the conformity of the provisional results as proclaimed by the National Independent Electoral Commission with the verdict of the ballot boxes," the AU said in a statement. The final vote tally had been scheduled to be released by the Election Commission once the Constitutional Court has ruled on challenges to the provisional results on Friday. "Even if the situation on the ground has been fortunately calm so far, it obviously remains a cause for concern," said Faki. In an initial statement on January 10, Faki urged all parties in Congo "to act in a way that consolidates democracy and preserves peace in the country." Rival Congolese opposition candidate Martin Fayulu lodged an appeal with the Election Commission last Friday, claiming that the results it announced were a "fabrication." Rwandan President Paul Kagame, who currently heads the 55-nation AU in plenum, said Thursday's meeting was aimed at preventing "people outside of our continent from meddling ... trying to find solutions for us." Last Sunday, the chairman of the South Africa Development Community (SADC), Zambian President Edgar Lungu suggested a "recount" was needed in DRC - on top of a SADC appeal that a national unity government be formed. On Thursday, the SADC appeared to backtrack, wary that a recount would heighten tensions, and instead urged the international community to respect "the ongoing internal legal and political processes for the finalization of the electoral process." SADC made no further mention of Sunday's appeal issued by Zambia's Lungu for a power-sharing Congolese government. Fayulu has, however, said he is not confident of winning before the nine-judge court, which he considers friendly to outgoing President Joseph Kabila. An influential voice is Congo's Catholic church last Friday said the result announced by the election commission was inconsistent with its own tallies compiled by 40,000 monitors.